So far this year, 175 patients have tested positive for swine flu in city hospitals and of these 50 have succumbed to the deadly infection. Indore: Five more patients, including a woman, have succumbed to swine flu here, taking the toll from the disease to 50 in the city since January 1, said a Madhya Pradesh health department officer Friday. The patients, aged between 48 and 57 years, died of swine flu (H1N1 virus) during the past three days at different hospitals in the city, he said. The deceased included one woman, the officer said. So far this year, 175 patients have tested positive for swine flu in city hospitals and of these 50 have succumbed to the deadly infection, he added. 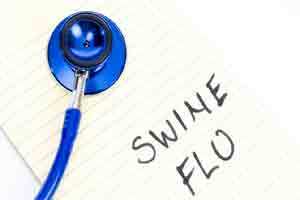 Swine flu is a viral, air-borne disease that spreads from person-to-person, through large droplets generated via coughing and sneezing, indirect contact by touching a contaminated object or surface (fomite transmission like telephone, cellphones, computers, door handles, doorbells, pens, toys) and close contact (including handshaking, hugging). Its main symptoms are fever, cough, sore throat, runny or stuffy nose, difficulty in breathing. Other symptoms may include body ache, headache, fatigue, chills, diarrhoea and vomiting and blood-stained sputum. There are three categories of H1N1 influenza — A, B and C.